Speculation is rife that Samsungwill debut the successor to its popular tablet-smartphone hybrid Galaxy Note at the upcoming IFA event scheduled to be held inBerlin in August end. 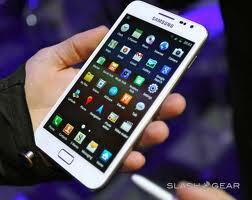 Likely to be called Galaxy Note 2, the hybrid device also known as phablet, is expected to hit retail stores in October. According to MK Business News of Korea,Samsung Galaxy Note 2 will feature a 5.5-inch touchscreen, slightly bigger than the current version's 5.3-inch display. However, the dimensions of the 'phablet' are reported to remain same. Galaxy Note 2 is expected to run on Android's latest iteration, Jelly Bean, and have a 12 or 13 megapixel camera, a significant upgrade from the current version's 8 megapixel snapper. However, Samsung is believed to have decided against using the unbreakable plane (UBP) display, which is more durable than other screens, in the hotly anticipated phone. It is also being anticipated that the device will have features like S-Voice, Smart Stay and S-Beam. Galaxy Note 2 is expected to be powered by a quad core Exynos 5250 processor and ARM Cortex-A15 CPU. MK Business News report says that Korean giant Samsung is timing the release of the Galaxy Note 2 to compete head-on against its biggest rival Apple, which is expected to release its latest iPhone during September or October.